I've been in a training class at work this week and lunch has been provided. A couple of the days we have ordered out for pizza. There are about a dozen people taking the class and I am the only vegetarian in the group, so we have been ordering 3 "meat" pizzas and 1 veggie pizza. The funny thing is, when the food arrives and people are actually choosing which pizza to eat, the veggie pizza ends up being the most popular. In fact, today when I went to get a second slice, the veggie pizza was already gone. It's interesting that if you ask people what they want on a pizza they'll usually include some form of meat, but when presented with a choice of pizzas right in front of them, it seems people will frequently opt for a veggie slice. Of course, this is just a small sample of people, but it is something I've observed in the past with other groups pizza eating habits as well. As I mentioned a few weeks ago, I'm trying to work on some things for personal improvement. One of them is "patience". An online dictionary site defines patience as "good-natured tolerance of delay or incompetence". I find that is something I really need to work on. It's easy to be good-natured when things are going well, but it's another story when one is under stress. So, I've been trying to be aware of when I might lose my patience and get frustrated with delays or with things I might perceive as "incompetence". Surprising, I found that just being aware of when I started reacting that way actually helped me reduce having such a negative reaction. Rather than having the impulse to get frustrated, I found trying to keep a positive attitude about the situation actually improved my mood. After a while, it starts to become a habit to keep a positive outlook in a situation. If you are the type of person who gets easily frustrated or aggravated when things go wrong, I'd highly recommend trying to be aware of when you find yourself reacting that way. Try to think of something positive about the situation. For example, if you are stuck in traffic, don't think of it as a loss of time or worry about all the cars in front of you. You can't make them go away. Maybe instead you can use the extra time to plan your day, or admire the scenery, or listen to the news on the radio. I know it sounds simple, but it really does help. It might be easier than you think to keep those negative feelings from happening. I think in the past I just got in the habit of having a negative reaction and accepted that that was how I am. Instead, I found it is possible to change. It takes some effort, but it is doable. Earlier last week I realized I was making progress when I was trying to reassemble a desk that I had moved up a flight of stairs. I was a bit tired and was lying on the floor on my back trying to put in a screw and it kept falling out and I'd have to search around for it and try again. Normally after 3 or 4 times of this happening I'd be very aggravated with my own incompetence and would have let out a loud "GRRRRRRRR" or "ARGGGGG" and maybe I would have given the desk a wack for good measure. But instead, I just found myself laughing at the situation. Instead of thinking it was a frustrating situation, I was thinking how silly I must have looked if someone had seen me trying in vain to put that screw in place. So I remained good natured. And isn't that what patience is all about? (At least that's what that dictionary web site said.) Another option is I could just be insane now. :-) But at least I'm in a good mood. I'm trying to simplify my life. One of my weaknesses in the past has been if I see something in the store that interests me and I can afford it, I'll buy it. 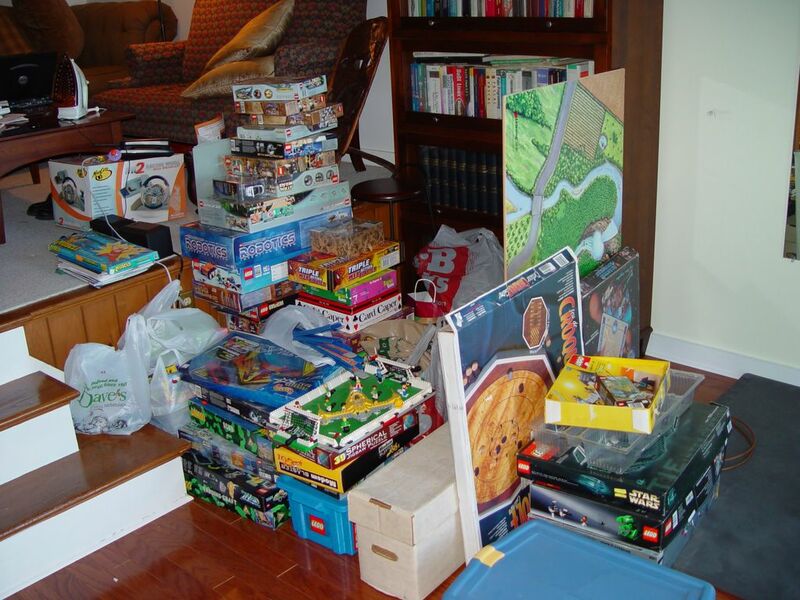 Several years ago I became a bit obsessed with acquiring Lego. As can be seen in this picture (which shows about 1/2 of my collection), I've accumulated quite a bit of it. I don't have a family to support, and have no debt other than my mortgage, so I didn't have any sort of inhibitors to get me to stop and think whether I really should be buying this stuff. In the back of my mind I think I might have been using an excuse that someday I might have a family and the kids would enjoy playing with the Lego, but this is even way to much stuff for a few kids, never mind one single adult. So, anyway, the point of all this isn't really to talk about Lego but is instead to remind me to control my spending habits a bit and not just buy something because I want it at the time. I should concentrate on the things I really need... like that newest XBox 360 game system. (Ha ha... just kidding about that last bit, really.) Seriously, though, there are more worthwhile things I could be doing with my money rather than being so self-indulgent. It's sometimes hard to avoid the constant barrage of advertisements, but I think a much simpler lifestyle would be better for me. It's strange how the mind works though. I'll be perfectly content and then receive a catalog in the mail and suddenly I find myself thinking a want to buy some new item which before I saw it, I didn't even know it existed and hence didn't want it. Why is it a human impulse to want to acquire stuff? Even when you do get what you want, you then soon after find you want something else. It reminds me of a saying an economics professor (Dr. Yngve Ramstead) freshman year of college at URI concluded the class with at the end of the semester. I think he attributed it to Buddha and it was something along the lines of "True happiness is not having what you want, but wanting what you have." There was a recent pop song that also included a similar line, but my economics class was back around 1986, so the professor definitely wasn't quoting Sheryl Crow. Although I don't know if it really is a Buddhist quote, that saying is what initially piqued my interest in Buddhist philosophy. Not that I've been actively studying Buddhism for the past 20 years - it was just one of those things that got me thinking that I really ought to learn more about Buddhism some day since it seems to have some very good points of view for living life. 20 years later and now I'm finally starting to learn a bit more about it.